Serbia hasn’t made it onto as many touring bands’ schedules as it should over the past few years, which is a shame for a number of reasons. Foremost of which is the fact that there are a wide range of glorious music venues throughout the country just waiting to be filled. From fortresses to cultural centres, Serbia is a nation of live music lovers with a concert venue for all genres and for all seasons. Here are the best of them. Belgrade’s jewel plays host to a number of major concerts throughout the year, and you’d be hard pressed to find a more romantic concert venue in the entire continent. The Sava and Danube rivers collide to create the perfect backdrop, as lush greenery and medieval fortifications rise up to envelop the throngs paying tribute to the legends of rock and roll. Amy Winehouse played her final show here, and it has also seen soldout shows by Iron Maiden, Green Day and more. Kalemegdan used to play host to Belgrade’s iconic Beer Fest, but an unfortunate mauling meant the festival moved across the river to Ušće just short of a decade ago. The park in New Belgrade is perfect for big shows, of course, with the wide expanse of grass and excellent transport links making it the ideal venue for major summer shows. Metallica famously played a major show here in 2013, as well as The Rolling Stones, Madonna and more. From expansive stadium rock style venues to a gritty cultural centre that allows you see the whites of the band’s eyes. KC Grad is an iconic part of Belgrade’s nightlife scene at this point, and not even the controversial Belgrade Waterfront project has managed to slow it down. The cultural centre puts on everything from intimate acoustic shows to sludge metal riff onslaughts and more. Whether you are going for live music or not is irrelevant, as KC Grad demands to be visited whatever the schedule. Another cultural centre, dom b-612 is one of Novi Sad’s many independent venues looking to forge a new nightlife path for Serbia’s second city. The collective has experienced a few problems with venues over the years, but has now settled near Freedom Square in the centre of the city. Live music is frequently held here, and this is a great spot to visit if you’re looking for a far more intimate experience than the one offered in Serbia’s hulking fortresses. Speaking of fortresses, what about the 18th century complex that hosts Serbia’s most famous festival on an annual basis? 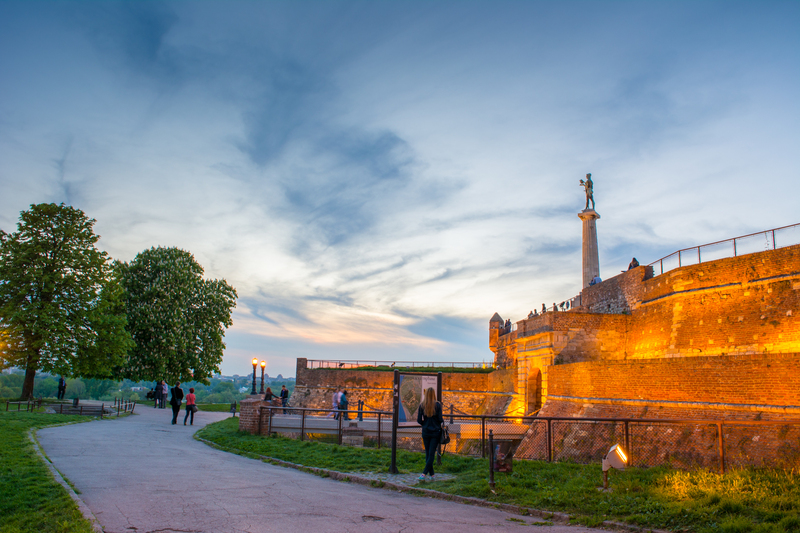 Petrovaradin Fortress overlooks Novi Sad from across the Danube and is arguably the most iconic landmark of the Serbian Athens. EXIT Festival invades every summer, and Petrovaradin occasionally hosts major shows from domestic and international artists alike. Sticking with fortresses for the time being, the complex down in Niš has seen some grim things throughout its brutal history. Patriots were imprisoned and tortured here over the centuries, but you are more likely to encounter melodies than maladies in this 18th-century stone monolith. Live music and festivals are frequent happenings here in the summer months, making this one of the most refreshing music venues in all of Serbia. Heading back to the capital and another iconic and intimate venue, BITEF is located next to the Bajloni market in Belgrade’s Dorćol neighbourhood. In the same building as the theatre of the same name, BITEF plays host to the Musicology sessions throughout winter and spring, putting on some of the best live music in the entire city. Belgrade’s youth centre is another iconic spot in the Serbian capital. Dom Omladine has a number of venues hidden within its corridors, making it a great venue for bands – big and small, major and independent. The schedule is full throughout the year, and nine times out of 10 there will be a fun show taking place here. It always pays to plan ahead though, so head to the website for the full events schedule.